Do USB microphones run on batteries? Are USB mics compatible with every operating system? How many USB microphones can I plug into my computer? Which is the Best USB Microphone for You? I bet you’re looking for the best USB microphone for your project, aren’t you? No, I’m not psychic. But I do know that technology and the internet have opened up a whole new world of opportunities for people like you and me. Whether your project is a YouTube video, a Podcast, or even a music demo, you’ll need the best equipment to help you produce a masterpiece. And that’s where the best USB microphone comes in. One thing everyone who deals with audio knows is that quality is gold. Whether you’re recording a podcast or an audiobook, the quality of the sound produced by the mic you use will determine the success or failure of your project. And because you want to produce gold, you will need to invest in the best USB microphone you can get. Here are seven USB mics you can trust to take you to the top of the charts. Coming from a company that is renowned for producing excellent high-performance pro-level mics, the Blue Snowball iCE is deserving of a spot on the best USB microphone list. The Snowball iCE is available in black or white, and measures 12.7 inches in circumference, making it at home even on the most cluttered of desktops. The orb-shaped Snowball iCE is easy to use for both professionals and novices out of the box as it comes with plenty of easy to use features. One of its strongest features is the cardioid polar pattern that gives it a bit more flexibility and thus enabling the mic to capture sound easily. With its premium looks and awesome design, the Snowball iCE will definitely impress. Like most USB mics it has 44.1kHz frequency and 16-bit sampling rates. This is an excellent choice if budget is a concern. Otherwise, this USB microphone has truly earned its 4.3 out of 5 stars rating due to exceptional performance and crisp sound quality. That and that it’s compatible with all Windows and Mac software. While we’re still on Blue, let me introduce you to what could well be the best USB microphone on the market: the Blue Yeti. If you’re looking for the best USB microphone that offers a multi-pattern model for recording or streaming, this is it. In fact, the Yeti is suitable for any application, a quality that has made it a favorite for many. The Blue Yeti features tri-capsule technology and four different pattern settings: cardioid, omnidirectional, stereo and bi-directional. And switching from one to the other is as easy as clicking a button. Blue’s tri-capsule technology is designed to give you rich, detailed sound. One of the best features that the Yeti comes with is that it gives you studio like control of your recording. This is a result of it being equipped with controls such as headphone volume, instant mute and microphone gain. Another very handy feature is the inclusion of a 3.5 mm headphone jack that allows you to monitor and listen without any latency delays. This plug and play USB mic is definitely a worthwhile investment since it comes in a plethora of colors for you to choose from. And its popularity has garnered it a 4.3 out of 5 stars rating -- especially from podcasters. If you’re wondering about the 96k in the Apogee MiC 96k stands for, yes, it means this baby can record up to 24-bit/96kHz. This is pretty impressive, not just for USB mic standards but studio recording as well. 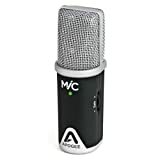 The Apogee MiC 96k is a professional studio quality cardioid condenser microphone -- don’t let its diminutive size fool you. And it is because of its compact size that the MiC 96k is a favorite for podcasters, voiceover artists, and interviewers. But size is not the only thing in the Apogee MiC 96k’s favor. Its greatest strength is its ability to easily capture solid, crisp, rich, and top quality sound. This is all thanks to its cardioid polar pattern design. Speaking of design, this is one well-designed mic that features a steel mesh housing on the capsule and a die-cast zinc body for a durable finish. It also comes with a gain control knob on the side. This 3.7 out of 5 stars rated USB mic has a few things against it though, great as it is. The first is that it is only compatible with Apple devices, and the second is the steep price tag. If you leave in the Apple ecosystem, this could be the best USB microphone for you. Shure is a brand that has been trusted for decades when it comes to audio equipment. And that’s why you should be confident in your purchase if you settle on a Shure MV51 USB microphone. Although it features a retro look, the MV51 packs a lot of modern features that you’ll be glad to have. Two things make this USB mic immediately stand out, and perhaps clinch the best USB microphone award. The first is that it allows you to record directly to your computer or directly to an iOS device (via the included Lightning USB cable). The second is that it comes with the option to use Digital Signal Processing (DSP) or to keep it off. With four DSP settings, this is a very versatile mic. Despite looking like a mic from the past, the MV51 has a pretty cool touch-control dashboard on its front panel replete with LED backlighting. The dashboard allows you to mute the mic and set different recording modes and also manipulate the volume for the zero latency 3.5mm headphone jack (you’ll find this on the rear panel). This 3.7 out of 5 stars rated USB microphone will put a dent in your pocket. But it is well worth it for such a superior USB mic. If you’re looking for the best USB microphone, in the budget-friendly segment, then set your eyes on the CAD U37. The U37 is a large condenser USB mic that features a cardioid pattern and can easily capture and record your project onto a computer. The CAD U37 is ideal for home studios as its cardioid pattern minimizes background noise and efficiently isolates the sound you desire to record. One reason that it is fast becoming a fan favorite is that its smooth, extended frequency response allows it to capture singing, speech, and instruments. A -10dB overload protection switch also helps to minimize distortion from loud sources. But the two biggest advantages you get from this USB microphone is that it comes with a few extras (a tripod stand and a 10 foot USB cable) and comes ready to use with Windows and Mac out of the box. Perhaps that’s why it has an impressive 4.1 out of 5 stars rating from thousands of satisfied users. The Audio-Technica AT2020USB+ is the USB rendition of the world famous Audio-Technica AT2020 microphone that has been around for a very long time. And just like its traditional counterpart, this is one awesome microphone. The best use for the AT2020USB+ is recording music as it does this beautifully. But if you want to use it for other purposes like podcasting or voiceovers, it will still do a great job. Coming with a mix control, this USB mic allows you to blend your mic’s signal with pre-recorded audio clips. Another great feature is that it comes with a built-in headphone jack with volume control to help you monitor your mic in real-time. 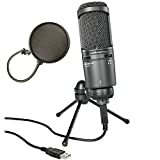 It has an Amazon rating of 4.6 out of 5 stars rated mic just might be the best USB microphone you spend your money on. The Samson Go Mic is not just an affordable USB mic, but it is also a very compact option if you’re always on the move. It features a small frame and can even clip onto your laptop. And because it doesn’t need any drivers, it comes ready to use. 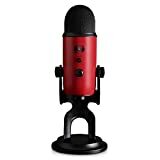 Although this is not the best USB microphone on the list for recording music, it still handles podcasts, voiceovers, and video chats extremely well. Another advantage this nifty little mic brings to the table is that it comes with cardioid and omnidirectional pattern settings. This USB mic deserves the 4.3 out of 5 stars rating it has earned for itself. To understand what makes a USB microphone special, it’s important to understand a traditional microphone first. A microphone, commonly (and fondly) called a mic, is a device that picks and translates sound vibrations in the air into electronic signals. These signals are then passed through a preamp or mixer to amplify the sound or to scribe them onto a recording medium. These sound signals are analog in nature. As for a USB mic, it contains every element of a traditional mic. But it takes things further by including two circuits that you cannot find in a traditional microphone. The first is a built-in preamp that makes connecting the mic to a mixer or external preamp needless. Secondly, a USB microphone also has an analog-to-digital (A/D) converter. This converts the microphone’s output from analog (voltage) to digital (data). These two additional features found on USB microphones make it possible to plug your microphone directly to your computer to manipulate your sound recording via your DAW software. Not only is this convenient you can produce your high-quality recordings, but it saves you tons of money you would have had to spend doing the same recordings in a professional studio. Although USB microphones started off as simple gimmick, they have become very popular. This has led to many companies making them to fill the gap in the market. And in the race to make the best USB microphone, consumers have benefitted in two ways. Firstly, USB microphones have become readily accessible. Most manufacturers have their products listed on many online stores, such as Amazon, or even sell them on their websites or retail outlets. Secondly, due to the proliferation of USB microphones, they are becoming more and more affordable. For instance, as you look for the best USB microphone for your home studio, you’ll find them ranging between $30 to $250 depending on make, quality, and purpose. You’ll find a USB microphone you can add to your studio -- no matter your budget. What are the main uses of a USB mic? Well, everything you’d need a traditional mic for. Let’s take a look at the four most common uses. Nothing reeks of unprofessionalism like arriving to interview someone and unpacking a lot of equipment that will also clutter the desk space. This is why a USB microphone is a reputation saver. Not only does it make you look professional, but with the best USB microphone, you’ll get amazingly crisp sound. Every podcaster knows that sound quality is important. And that’s why you wouldn’t want to fiddle with complicated equipment to get the kind of sound quality you want. With a USB mic, the external mixer and preamp are eliminated, meaning you focus on what you do best -- conveying your valuable information. All you have to do is plug your mic into your computer, and you’re good to go. For voiceover work, sound quality can never be stressed too much. The problem with many voiceover artists is they only have basic skills when it comes to providing quality services. This is where a great USB mics come to the rescue as they give everyone access to exceptional sound quality. Video has become the most consumed type of content. And if there’s one thing that will turn your audience off faster than anything, it’s poor sound quality. That’s why investing in the best USB microphone is the best thing you can do for yourself if you want to rock on YouTube, Facebook Live, a webinar you’re hosting or any other video content. Here’s a quick look at some frequently asked questions people ask when looking for the best USB microphone. Questions and answers are the best way to get to understand what you are getting in your new mic. The simple answer is no. USB microphones are designed to use phantom power from the USB port they are plugged into. This makes it possible to have tiny USB mics and also reduces the need for extra cables. USB mics can be used with any Windows, Mac computer, and iPads and tablets as well. This is the reason USB microphones are becoming popular -- they are versatile and can be used on the go. If you run windows, you can only use one USB mic at a time. If you’re a Mac user, however, you have the option to use multiple USB mics at a time, but it will take a bit of configuration. Now that you are ready to get yourself the best USB microphone your budget and purpose of use have dictated, let me show you why you should trust this review to be unbiased. I’ll do this by showing you what qualifies each mic on the list to be on this best USB microphone list. One of the most important criteria we used is customer reviews that were left on Amazon. This is because these reviews reflect a real-life picture of what each mic is capable of and also where it falls short. The other factors we took into consideration are the build quality and technical capabilities of each microphone. Now that you’ve seen the efficacy of this review let’s go ahead and get you the best USB microphone for your needs. Having seen these USB mics, which one stands out to you like the best USB microphone? I know even with just seven models before you, choosing can be a daunting task. Let me help you out a bit with a couple of recommendations. If you’re just starting as a podcaster or YouTuber, I’d recommend you go for the budget-friendly Blue Snowball iCE. However, if you have the financial muscle to get the best USB microphone here, I’d strongly suggest the Shure MV51.